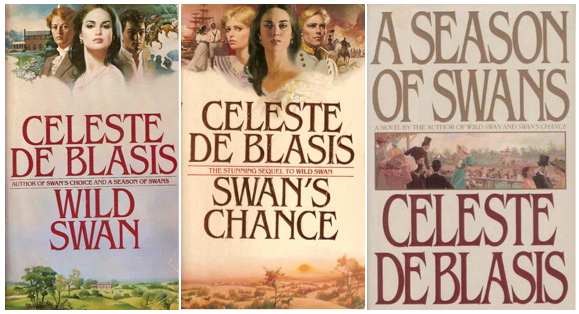 I don’t think very many people have read the Wild Swan books, but they were some of my favorite books as a teenager. I loved them so much I developed a funny kind of tradition around them. I think I first read these in the 8th grade, then decided not to obey my impulse to immediately reread the series and instead saved them to reread my first week of high school. I then didn’t reread them again until my first week of college. Looking back this all feels very silly. Obviously, there is something that captivated me about this series. They are 1980’s half romance/ half historical epic novels set in the early 1800s. They also take place in my hometown Annapolis, so that might have been part of the appeal. But they aren’t that good. They are pretty over-written. The good characters are always good and the bad characters are always bad. The history present within the chapters is too over-simplified. And for the most part I’ve outgrown both historical fiction and this kind of romance novel. But… since I’m starting grad school this week, I decided to bring the books to New York with me. I guess I couldn’t let the tradition go. And even though I think I’m noticing even more of the flaws than ever, I’m also really enjoying reading my way though the books and remembering how much I loved them when I was younger. There’s also something really nice about reading something familiar while my life is overwhelmingly new and strange. Do you have any books that you read purely for nostalgic reasons or funny reading traditions? If so, let me know in the comments! This entry was posted in Uncategorized and tagged books, Celeste De Blasis, Reading, Wild Swan by Alison Doherty. Bookmark the permalink. The first time I read Where the Red Fern Grows, I cried and a tear splashed onto the page and left a tear stain. After that, every time I would read it and cry, I’d purposely let the tear fall on that same page. It’s a one-page lovely little collection of my childhood feels. Wait that’s adorable. I feel like I cried on almost every page of that book. As much as I liked it, it’s too sad for me to reread.